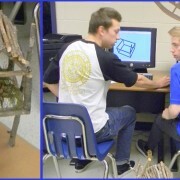 Mr. Aadahl’s architectural students used Sketchup 3D modeling software to design treehouses. They then rendered their treehouse models using organic materials. This project helped them to better understand the concepts of structure, form and function. Attention All Students: Due to the Presidential Dual Primary, please plan to take the bus on Tuesday, March 1st to reduce congestion and avoid limited parking. If you must drive, please plan to enter the building through the main office doors. If you must be dropped off, you will be directed to drop off closer to the front of the building. Please exit your vehicle at the identified location. Lafayette Staff will be available to help guide you. Outdoor track practice will begin today. Those who are interested should meet in the upper Commons immediately after school. The National Art Honor Society will hold a meeting on Wednesday, March 2 at 2:30 in room 103, all members must attend. Attention students – Friday, March 4th at 8:00 a local US Naval Academy representative will be visiting LHS. If you are interested the sign-up sheet is in the blue binder in the counseling office. Except for athletic and drama practices there will be no after school activities today. This past weekend, the boys’ track team placed 3rd in the state. The girls’ team placed 5th. Mike Tyler was the state champion in the high jump. Konrad Steck was 2nd in the 1600 meters with a time of 4 min. and 15 sec. He was also 4th in the 1,000 meters. Liam Bongo placed 8th in the 3200 meter run. Mike Tyler was 7th in the 55 meter hurdles. The 4X400 meter relay , consisting of Konrad Steck, Keelan Hendricks, Rashawn Smith and Derrick Abson placed 4th. The 4X800 meter relay consisting of Cade Moreno, Marcos Piggott, Liam Bongo and Derrick Abson placed 8th in the state. Jack Palmer was 8th in the pole vault. Mike Tyler was 2nd in the triple jump and 7th in the long jump. Audrey Hurley was 3rd in the 500 meters. She was also 4th in the 300 meters. Delaney Savedge was 4th in the 3200 meters. Axelis Brender-Brandis was 2nd in the triple jump. Serenity Chavez was 5th in the 1,00 meters. Brook Crookston was 7th in the 1600 meter run. The 4X8 relay team consisting of Delaney Savedge, Baylie Gentry, Serenity Chavez and Summer Chambers placed 7th. GREAT MEET RUNNING RAMS! Outdoor track practice will begin on Monday, February 29th. Those who are interested should meet in the Upper Commons immediately after school. The National Art Honor Society will hold a meeting on Wednesday, March 2 at 2:30 in room 103. All members must attend. Attention All Students: Due to the Presidential Primary, please plan to take the bus on Tuesday, March 1st to reduce congestion and avoid limited parking. If you must drive, please plan to enter the building through the main office doors. If you must be dropped off, you will be directed to drop off closer to the front of the building. Please exit your vehicle at the identified location. Lafayette Staff will be available to help guide you. Congrats to the LHS RAM Stars! https://wjccschools.org/lhs/wp-content/uploads/sites/20/2016/02/RAM-Star-Feb-Resized.jpg 375 665 Amy Wallisch https://wjccschools.org/lhs/wp-content/uploads/sites/20/2017/10/Lafayette-High-School.png Amy Wallisch2016-02-25 11:16:222016-02-25 11:16:22Congrats to the LHS RAM Stars! The History on Film Club presents “42 – A True Story of an American Legend” today at 2:30 in the lecture hall. Come enjoy popcorn, drinks and see the story of Jackie Robinson from his signing with the Brooklyn Dodgers organization in 1945 to his historic 1947 rookie season when he broke the color barrier in Major League Baseball. Bayport is now selling t-shirts at our desk; they are free for student members only. The cost is $10.00 for teachers and non-members. Existing members wear your Bayport t-shirt on a Tuesday and stop by the Bayport desk so your name can be entered into a monthly drawing for a $25.00 gift card. The library will be closing today at 2:30. We will resume our normal schedule tomorrow. For all track prospects – there will be an Outdoor Track meeting today at 2:30 pm in the upper commons. The History on Film Club presents “42 – A True Story of an American Legend” on Thursday, February 25th at 2:30 in the lecture hall. Come enjoy popcorn, drinks and see the story of Jackie Robinson from his signing with the Brooklyn Dodgers organization in 1945 to his historic 1947 rookie season when he broke the color barrier in Major League Baseball. Bayport is hosting “Winning Wednesdays” where a student member will be drawn to win a $25.00 gift card every week. If you are interested in opening an account or purchasing a t-shirt please visit the Bayport desk during your lunch. Local dentist providing custom fit sport mouthguards. Click mouth guard day to see further information for free protection. 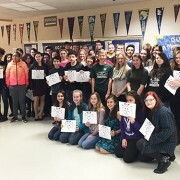 https://wjccschools.org/lhs/wp-content/uploads/sites/20/2015/01/07-e1420241870928.jpg 225 300 Daniel Gotthardt https://wjccschools.org/lhs/wp-content/uploads/sites/20/2017/10/Lafayette-High-School.png Daniel Gotthardt2016-02-23 15:42:152016-02-23 15:48:16Local dentist providing custom fit sport mouthguards. Click mouth guard day to see further information for free protection. There will be a mandatory FCCLA meeting today in room 417 at 2:30pm. Mrs. Carter needs to meet with all FCCLA members so that we can plan for our upcoming event. For all track prospects – there will be an Outdoor Track meeting on Wednesday, February 24th at 2:30pm in the upper commons. Bayport is now selling t-shirts at our desk; they are free for student members only. The cost is $10.00 for teachers and non-member’s. Existing members wear your Bayport t-shirt on a Tuesday and stop by the Bayport desk so your name can be entered into a monthly drawing for a $25.00 gift card. The library will be closing today at 2:30. They will resume normal hours on Tuesday. There will be a mandatory FCCLA meeting on Tuesday, February 23rd in room 417 at 2:30pm. Mrs. Carter needs to meet with all FCCLA members so that we can plan for our upcoming event. This past Thursday at the Indoor Regional Championship, LHS boys won the Regional Championship. The boys were led by Mike Tyler, Konrad Steck, Rashawn Smith, Derrick Abson, Hezekiah Grimsley, Leighton Holm, Jax Palmer and Liam Bonga. The LHS girls were first runner up, the girls were led by Audrey Hurley, Brooke Crookston, Delaney Savedge, Serenity Chavez, Selena Jones and Peyton Blanding. 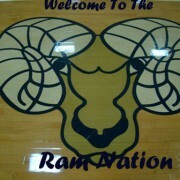 Great job Running Rams! Student drivers – you are to park in the student parking lot only. If you are found parking in the staff parking lot, your parking pass will be revoked for one week. Please park in the student lot. All girls interested in trying out for the LHS softball team –there will be an important meeting today immediately after school in front of Mr. Barner’s office. All boys interested in playing tennis this spring – come to the informational meeting today after school in the lecture hall. If you have any questions please see Mr. Jefferson. Seniors – applications for scholarships from the WJCC Scholarship Fund are now available online. Please visit our school website from more information and the application link. Applications must be submitted by Sunday, March 6th by 8:00pm.